Okra Nutrition Facts: Surprise, it's a Super Veggie! Before I post my super duper okra recipes, I want to get you excited about okra. Though okra was voted most hated veggie, it can actually be quite tasty and nutritious! So I'm here to convert the haters to lovers! oKra. Okra is actually incredibly healthy despite it's unappealing reputation. Okra is low in calories. 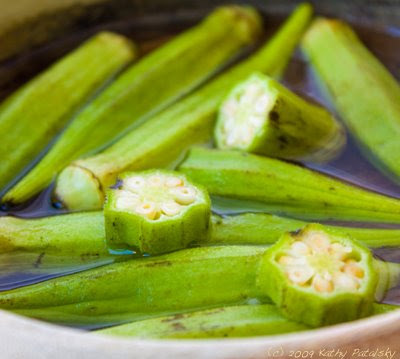 One cup of raw okra only has around 30 calories. And in that low-calorie cup in a whopping 66% RDA of Vitamin K! Okra is also high is calcium, fiber, vitamin C, protein, folate, manganese and magnesium. Why munch not-nutrient-dense celery or iceberg lettuce for a low-calorie veggie when you can munch the much-more-nutrient-dense super food veggie okra!